Cons: need to make sure you can put the AC at the right spot for the air flow to be good, meaning that if you really want your AC at a specific spot, it could be that you wont be able to use this properly. The Edgestar was getting is air through the back and pushing air to the front, this on is only from the left side of the unit and put air in front. Pros: cheap, more powerful than the edgestar servercool 15000btu. This unit is able to handle 12 server, which 2 of them are bitcoin miner with gpu, temperature is steady at 22 degree (that's what we want) and a lot of time the AC just stop because the temperature is good enough that it doesn't need to run (so we save lots of electricity, the old edgestar servercool 15000btu was running all the time).One issue I had with it though, my AC filter was facing the wall, the air was circulating but wasn't able to keep up with the temperature, but as soon as I put my AC filter facing the other way made a big difference. Make sure you think about how the air flow arround your server room.PS: I don't have computer rack, only a big wood rack with all the server on, I can't review how this is going in a rack. There's nothing better than working in an environment that is so cool, refreshing, and comfortable, thanks to the TrippLite SRCOOL12K Portable Air Conditioning Unit. This amazing air conditioning unit deliver a remarkable 12,000 BTU of cooling power (greater than twice the cooling capacity of nearest competitor) to keep your work area at low temperature. It has a built-in evaporator, so it doesn't have a water collection tank that needed to be emptied every hour. With the TrippLite SRCOOL12K Portable Air Conditioning Unit, you can secure a very comfortable work area for you and your equipment without causing damage to our planet as it designed without the ozone depleting R22 refrigerant. 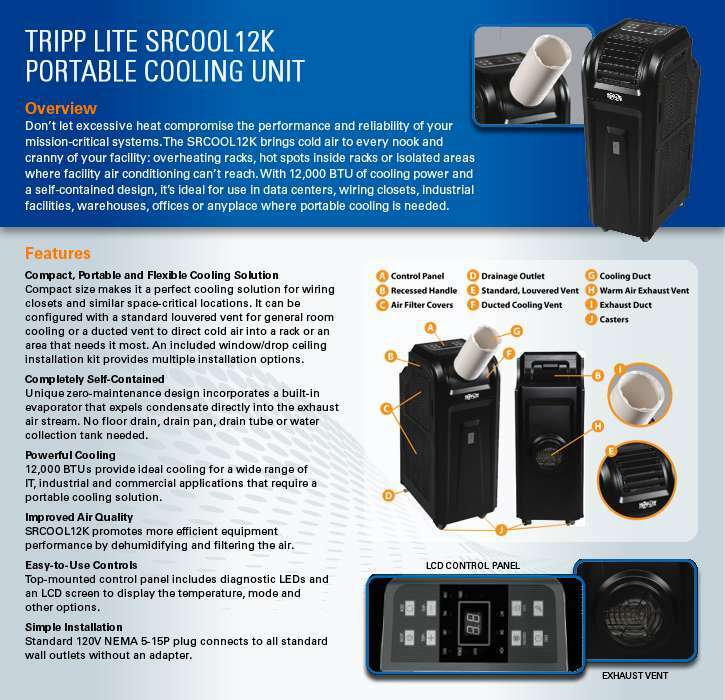 Get the TrippLite SRCOOL12K Portable Air Conditioning Unit today! Window/drop ceiling installation kit is included for extracting heat. Refrigerant Amount : 22 oz.